Fat Squirrel Trapped in Can! Yes, it's true. I took the easy way out. 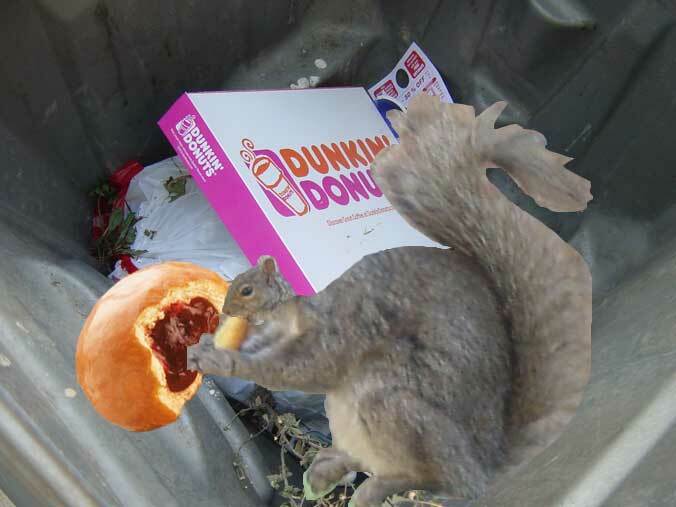 I started eating food from people's garbage cans. I know. I know, it isn't healthy. Don't you think I've realized that by now?! I mean, I'm stuck in this can. I can't get out. Back in the olden days, when the owner of the can used to throw bags of garbage in this can, I could run out. One time I even ran up her arm! Believe me that was frightening! She screamed and dropped the lid. That could've been my head! Luckily though, I was fast. But then, over the years, it just got harder and harder to jump to. She'd throw a bag of garbage in and I'd just wait and see what it was. Now it's useless. I just can't get out of this can. Sure I miss my friends in the trees. But the thing is, it's actually warm in here in the winter. And I get food every week. So what would be the point of venturing out? © The Snooze.com. all rights reserved.